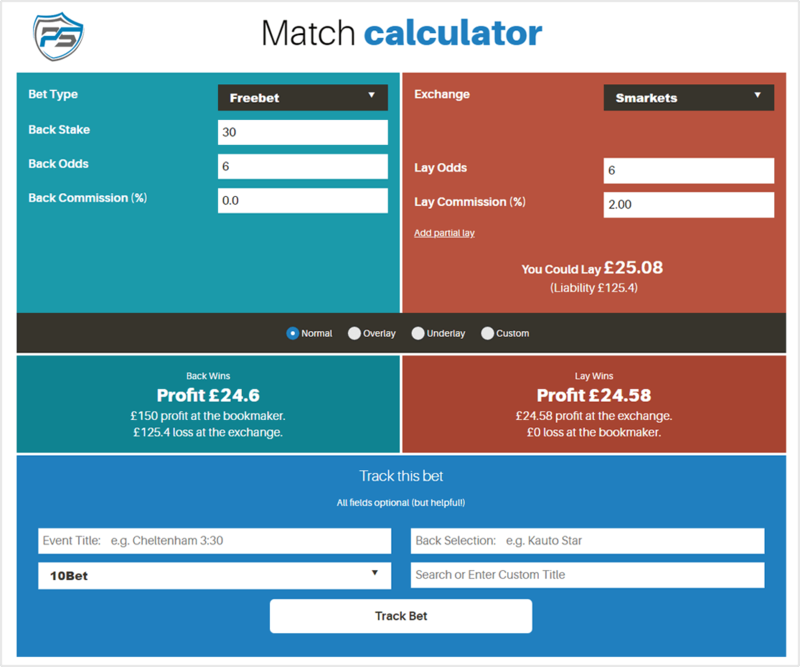 The matched betting calculator is an important tool when matched betting. It allows you to calculate the ideal lay stakes required to return the maximum profit from each bookmaker offer. The matched betting calculator at ProfitSquad is an advanced calculator which takes into account various bet types, back odds, lay odds, bookmaker commission and more. With bookmakers ing available various types of offers other than a standard free bet, it can be difficult to know how much to lay to return the best profit. However, the matched betting calculator from Profit Squad makes the process quick and easy. Simply enter the details of your bet and the tool will automatically calculate your ideal lay stakes. By covering a number of bet offer types, the calculator can be used for the majority of bookmakers offers of which can return a profit. Overlay – Used to increase your profits if your back bet wins with the bookmaker and break even if your lay bet wins on the exchange. Underlay – Used to increase your profits if your lay bet wins on the exchange and break even if your back bet wins with the bookmaker. Custom – Used when you would like to vary the overall returns at either the bookmaker or the exchange based on the outcome of your bet. Select a betting exchange from the drop-down menu or input the exchange commission manually. The ideal lay stake will then be displayed. If you wish, you can then select one of the advanced features such as overlay/underlay and the lay stake will update automatically. Some bet types will require some additional information such as bonus amount if you are due to receive one or the enhanced odds if you are claiming them. The calculator is a simple yet powerful matched betting tool which is extremely useful and accessible to both beginners and experienced matched bettors. If you are accessing the matched betting calculator from an event in the OddsMatcher, the event, back/lay odds and exchange commission will be pre-populated meaning you just have to enter the back stake to complete the calculation. Another feature when accessing the calculator from the OddsMatcher is that the odds will automatically update if they happen to change at either the bookmaker or the exchange while you are calculating your lay stakes. If this happens, you will be notified of the odds changing, allowing you to refresh the lay stake based on the new odds. Once you have calculated your lay stakes and placed your back & lay bets, you can track your bet using the bet tracking feature from within the calculator. Simply click on the ‘Track Bet’ button and all of the details of the bet, including the profit, will be recorded in your bet history in your Profit Squad account. When your bet has settled, you can revisit your bet and mark whether it won at the bookmaker or exchange which will update your overall matched betting profit total in your account.